Whether you are living in dormitories or shared apartments or houses, you always feel the need to keep your valuables safe and locked up from your roommates. If you are looking to find the best dorm room lock box for college you could possibly get for your valuables and important documents, we’ve listed some of the best-rated dorm room lock boxes below. 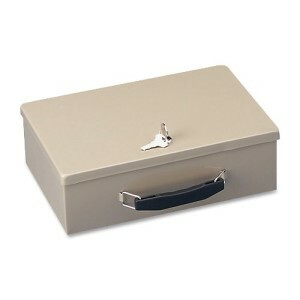 This security box is an essential dorm room lock box for college students or those living in shared apartments. Whether in the home or in your small business or shops, it is great for holding handguns, valuables such as cash and jewelry as well as important documents like passports, titles, receipts and more. Made of heavy-gauge steel with double insulated walls and scratch and chip-resistant finish, it is made to las even with daily use. It’s tested for protecting your valuables from fire up to 750 degrees for 15 to 20 minutes. The STEELMASTER Fire-Retardant Security Box can be opened with its sturdy locking key latch, and you get two keys with the box. This Fire-retardant steel security box is great for protecting petty cash, jewelry, passports and other important documents in the office or home from prying eyes and in case of fire. A robust locking key latch that will keep the box secure. Tested to resist fire at 750 degrees for up to 15-20 minutes. Equipped with a handle for easy carrying that are for the use of small businesses, retail shops or at home. 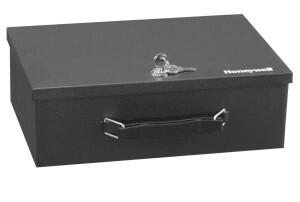 With its double steel wall construction, the Honeywell Model 6104 Fire Resistant Steel Security Box makes for a great dorm room lock box for college as well as for homes and businesses. It has a fire resistant insulation within the double steel wall to protect your valuables from fire. With a concealed hinge, it helps keep your things from prying eyes. Its foam padded floor prevents your items from getting scratched. The powder coat finish prevents scratches on the outside. Constructed with a double steel wall and an interior with foam padded bottom. It is small enough, light enough but sturdy enough and big enough, which is just what you need from a fire proof dormitory security box, a home lock box or a business petty-cash container. Sturdy key lock with 2 keys. Protective insulation that gives 1/2-hours fire protection. The Fire-Safe Waterproof Chest made by SentrySafe is preferred by those who would like the added protection from both fire and water for their important documents and valuables that are easy to transport. It has been proven to protect its contents for ½ hour and is ETL verified as a waterproof container. It has a handle that makes it so easy to carry your stored valuables in the dormitories, apartments, or homes with a key lock for privacy. As a concerned parent, we want to ensure that our college students can keep their valuable items secure and safe from other people, fire or water and whether in the dorm or while on the move traveling during school breaks. All that is possible with this solid lock box that offers both fire and water protection and is a perfect place to store important documents and other valuable items. Solid key lock that will grant privacy for your valuables. Verified 1/2-hour fire protection for your CDs, DVDs, USBs and memory sticks. Verified to protect your valuables from getting damaged by water. 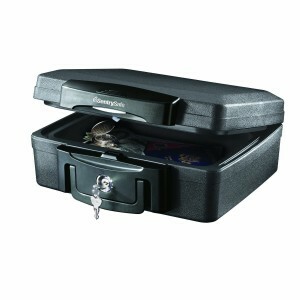 Handle that allow easy transportation of the safe. If you are looking for a dorm room lock box for college, the SentrySafe 1200PK Pink Fire Chest may be the best choice for you. Besides it’s convenient size and its lovely pink color, it also happens to be UL classified and ETL verified which guarantee a 30 minutes fire protection. It is also a Pink Ribbon product, so $1 of its proceeds will be donated towards fighting breast cancer. Solid pink construction that provide fire and water protection. The SentrySafe 1200PK Pink Fire Chest is a favorite for ladies and recommended by firefighters due to its pink color. Unlike other items, its bright color helps to find the box very quickly after the occurrence of a fire. 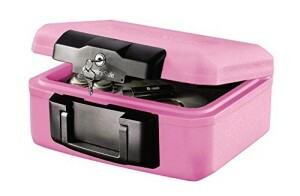 This lock box has great value that goes a long way since a small portion of the sale goes towards breast cancer research. Sturdy key lock that give privacy for your valuables.